I cheated on this one. It's semi-autobiographical. "Now that you've made it to the top, what do you think?" Will asked. "Do they call it Old Rag because that's what you feel like after climbing over all those rocks?" "Damn, Ralph, all you've done is complain the whole way up here." "Well, I'm sweaty, thirsty, and shaking from exhaustion, so just take your stupid picture so I can set down and rest." As Ralph posed for the camera, he forgot about the climb, the heat, even his bruised knees as he gazed across the rolling hills and patchwork farmlands that stretched out below him, the Earth blending into an azure sky at a distant horizon while the clouds passed almost within his reach—a perspective both humbling in scope and surprising with its recuperative powers. Yes! So true... great thoughts. Love Old Rag Mtn. Seriously, so beautiful down there in VA. I miss it! I've been up there several times, but it's been a few years now since my last climb. Have to do it again - the rock scramble is a great workout and on a clear day there's some really good photo opportunities. It does get a little tricky when there's ice on the rocks, but winter hikes can be fun, too. I really like this! Semi-autobiographical is okay; it is still fictional! Thanks! Maybe I should have called it my five-sentence docu-drama. 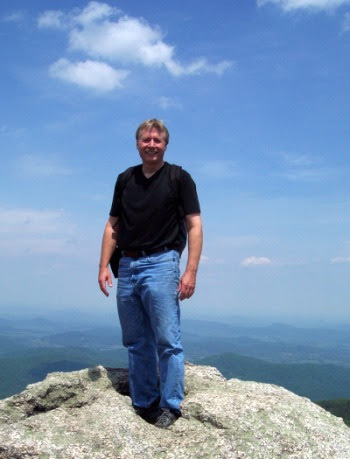 If I get the right prompt, maybe I'll do one about my old geography teacher that led the hike the first time I went up Old Rag. He's about 80 years old now and still does the hike every year that weather permits. Amazing how restorative a wonderful view can be. My love and I were in Virginia a few months ago visiting his family. They live on Belcher Mountain and we hiked around there a few times. No matter how tired, hot, or achy we were it never ceased to amaze me how looking at the natural beauty could enliven us. There always seems to be something new to see even when you go over a trail you've hiked many times - and when the seasons change, it's even better. It's almost a shock to the mind the first time you look down on a large valley and can't see a road or a house. Love ♥ So true. Nature's awesomeness can take away pain in a heartbeat. Lovely write! My writing is almost always at least semi-autobiographical. Isn't all fiction? Thanks! In some of the longer stories that I'm working on there are several scenes that are slightly modified bits of my life. Probably more than I'd like to admit to! Nicely done! I've never thought of using any of the prompts for an autobiographical story before, but I really like it! You captured the moment perfectly. Thanks! I hadn't thought of it before either, but I couldn't come up with anything else! I'm glad that Ralph found the climb worth it in the end. Enjoyed the conversation and the description of Ralph's ragged state on arrival at the top. Thanks! It's a great view!